On February 15, 2018, at a forum cohosted by Sunovion Pharmaceuticals, the Partnership released its latest resource highlighting the importance of the life sciences industry cluster to our regional economy as well as its impact on the Commonwealth's leadership in life sciences. This strong life science presence in 495/MetroWest directly links the Commonwealth's two other life science hubs, namely Boston and Worcester. 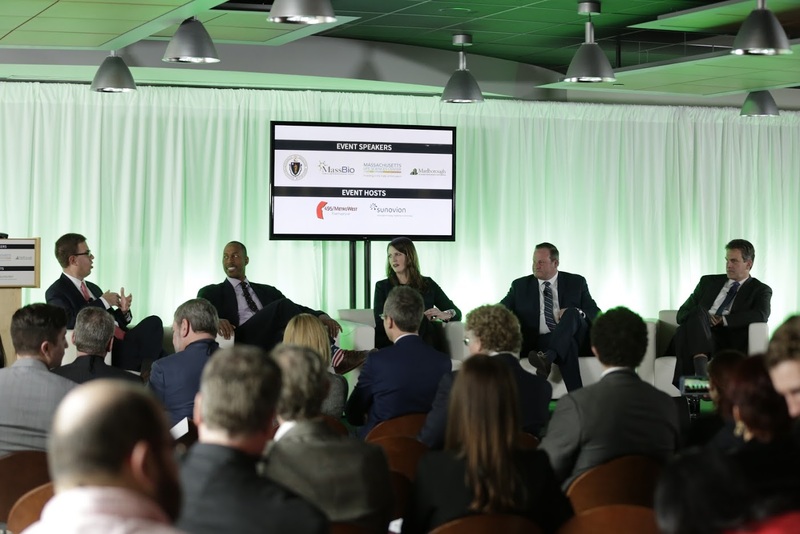 The forum featured a panel of distinguished guests discussing the importance of the life science sector and culture from state, regional, local and industry perspective. We are grateful for the participation by Massachusetts Secretary of Housing & Economic Development Jay Ash, President & CEO of the Massachusetts Life Sciences Center (MLSC) Travis McCready, President & CEO of Massachusetts Biotechnology Council Robert Coughlin, and Executive Director of the Marlborough Economic Development Corporation Meredith Harris. The panel was moderated by the Partnership's Executive Director, Paul Matthews, following his presentation on the Partnership's findings on the life science impact on the 495/MetroWest Region. See resource links below. NEW!! CLICK HERE to see the highlights video! Special Thanks to our host! The 495/MetroWest Partnership is pleased to inform you of a new MassDOT webpage dedicated to the I-495/I-90 Interchange Improvements Project. In addition to past advocacy and outreach outlined below, the Partnership has advocated for this Project for many years, most recently in our formal commentary on the FY18-22 Capital Investment Plan (CIP) for MassDOT. The current MassDOT CIP includes over $220 Million for the Project as it continues to move forward. In the lead up to the current design contract, the Partnership hosted a series of meetings on the Project, given its importance to our region and its status as #6 on our 495/MetroWest Region's 2014 Top Ten Transportation Nightmares. For your convenience, we have provided links to the Environmental Notification Form (ENF) for the project (filed March 2, 2015) as well as the MassDOT presentation from the Massachusetts Environmental Policy Act (MEPA) Scoping Session on March 19, 2015. Visit our Transportation Committee page for more details on our work on behalf of the 495/MetroWest region. If communities or employers in the 495/MetroWest region are interested in specific town data, please visit the Resources Page or contact the Partnership staff. The Partnership has followed and engaged in the discussion on potential commuter rail service to Foxborough since the 2010 MBTA study on the service’s feasibility, while also providing regional perspective and outreach on the subsequent study conducted by VHB. We provided background on these issues to Foxborough’s Board of Selectmen during the consideration of potential service in the fall of 2014, provided our support for the pilot during their recent deliberations, and are working with municipal staff and supporters on the pilot. This proposed public/private pilot service is limited in its time and scope, allowing for a unique opportunity to evaluate its impact and success at increasing overall ridership on the Fairmount Commuter Rail Line. Extending weekday service on an existing Line to Foxborough Station, on MassDOT owned infrastructure, holds the potential for a real return on investment for the Commonwealth. The Foxborough Pilot would more effectively utilize existing infrastructure such as the Framingham Secondary Line while relieving capacity and parking constraints at the stations surrounding Foxborough. Additionally, this proposed service would be a public private partnership benefiting the MBTA and the riders, as well as residents, employers, commuters, and taxpayers of Foxborough and the 495/MetroWest region. Such weekday commuter service would provide a tremendous benefit to Foxborough residents commuting to other parts of the Commonwealth, as well as opening up new employment opportunities for riders on the Fairmount Line, given the strong Foxborough employment base. The service’s probable impact on the local and regional economy is demonstrated by the strong support from the Foxborough Economic Development Committee (EDC) and in the Foxborough Master Plan. Weekday commuter rail service would connect Foxborough and its largest employers to the Boston-area labor pool, as well as boost development efforts along nearby US Route 1. At their bi-monthly meeting on August 14, 2017, the Fiscal Management Control Board of the MBTA voted four to one in favor of approving the Foxborough Pilot Program. Starting at a date to be determined in Spring 2019, commuter rail trains will begin running to the Foxborough station full time. Eight trains which are currently servicing the Fairmont Line will have Foxborough added to their routes as well as one train currently servicing the Franklin Line. Projections indicate that these extensions will not have a negative impact on existing service on either line. The Pilot Program will run for approximately eleven and a half months, at which point the FMCB will evaluate the service and make a determination on whether to make the service permanent. The addition of full-time commuter rail service to Foxborough is expected to spur economic development in the town and surrounding communities. The service will allow greater opportunities both for workers commuting into Boston as well as employers looking to attract Boston-area residents. The large number of parking spaces available at Gillete Stadium will also provide an alternative to those existing commuter rail users struggling with over-crowding at nearby stations. Finally, the Foxborough Pilot Program will serve as an invaluable test for the MBTA as they evaluate Commuter Rail Service in Massachusetts. Following a successful nomination process in 2004, which identified the 495/MetroWest region's top transportation priorities and resulted in several studies and plans, new transit options, construction projects, and infrastructure improvements in the region, the 495/MetroWest Partnership again partnered with the MetroWest Daily News to identify the top ten Transportation Nightmares in the 495/MetroWest region. If you missed the reveal of the new Nightmares list, be sure to check out the new interactive site and be part of the Partnership's advocacy for transportation investments in the region. The Partnership thanks VHB for creating and hosting the site which includes interactive maps, updates on the 2004 Nightmares, and links to the MetroWest Daily News coverage! The Partnership also thanks readers, residents, and employers for participating in the public nomination process, helping to focus the Partnership's advocacy efforts on the projects important to the residents and regional economy in 495/MetroWest! READ MORE on the new Nightmares site!